The $199 Oculus Go is Facebook's solution to fully standalone mobile gaming. But is it as good as it sounds? We went hands on with the device at GDC 2018. Oculus first announced its new Oculus Go at the Oculus Connect 4 developer conference last October Positioned somewhere between the Gear VR and the Rift, the Go will offer a wire-free VR experience without the need for a phone to power it when it launches. We went hands on with the device at the 2018 Game Developers Conference in San Francisco, and walked away pretty impressed. The Oculus Go runs on a Qualcomm Snapdragon 821, the same chip in Google’s first-generation Pixel phone. This isn’t the absolute newest chipset available from Qualcomm, but it offers things like three degrees of freedom, so you can play games simply by rotating your head. The Oculus Go comes with a controller too, so don’t worry about getting a neck-ache playing games. This controller is different from the one on the Gear VR and the Rift, and I really liked it. Your thumb rests naturally on the touchpad and your pointer finger sits on the trigger area. I never felt like my hand was cramping playing these games. The physical headset is quite light, which makes sense. All it needs to house are the lenses, processor, and battery. I never felt feel like it was going to fall off my face. The Go was more comfortable than something like Google’s Daydream View, but that may be because band was much more secure, with vertical and horizontal elastic to keep it firmly on your head. These lenses are even better than the ones in the Oculus Rift. Oculus is using a special fast-switching panel to reduce lag and glare, and its very noticeable. The game I played felt extremely fluid, and I didn’t notice nearly as much lag as on the Gear VR. This may have been partially because the game I played was specifically optimized for this chip, but it’s good to see Oculus put more thought into the screen. The other reason games run so well on this device is a technique called “foveated rendering.” This essentially renders things in your direct view at full resolution while reducing the resolution of things in your peripheral vision. It significantly reduces processor load and can help games run much better, especially when powered by a mobile chipset. The Go has a headset jack if you want to attach your favorite headphones. It also has speakers which sound really good built right into the headset so you can play with no extra wires. Unless you need to be playing in absolute silence I would probably just use those. The Oculus Go comes with 32GB of storage on each unit, which should be good enough to store a number of different titles. Netflix and Hulu are also planning to make apps compatible with the headset though, so you should probably be a bit picky about how much content you store on it at any given time. The Go will cost $199. It’s considerably more than the $129 Gear VR and $99 Google Daydream View, which might make it a harder sell to consumers. Not needing a dedicated phone to use in the headset could offset the cost difference, though. If that is important to you, the Go might be worth a closer look. Oculus’ Project Santa Cruz is another piece of hardware customers might want to consider before dropping their dollars on the Go. Santa Cruz is another standalone headset coming later this year, which will reportedly have the full power of the Oculus Rift — a huge step up over the Oculus Go. Its price will likely reflect the level of innovation this will introduce, but if you have been patiently waiting for a full-powered wireless solution you probably weren’t expecting it to come cheap. The Rift’s recent price drop to $399 may make it seem more reasonable, but without a powerful gaming PC you’ll likely have to settle for smartphone-level graphics like what the Go offers. 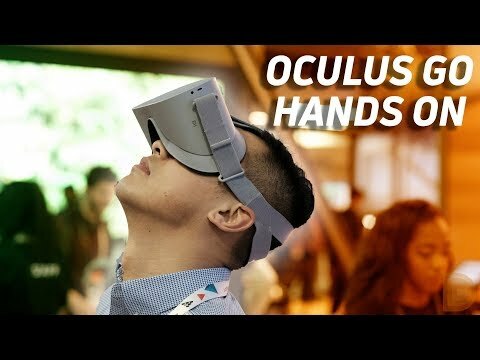 What do you think about the Oculus Go? Let us know your thoughts in the comments section below.